NASA Astronaut Mike Fossum operates small, autonomous satellites aboard the International Space Station in November 2011. Every year, high school students compete to submit computer code to run in the satellites, called SPHERES. Would you trust a 16-year-old in space? NASA evidently does. Just after the sun rose on the East Coast today (Jan. 11), astronauts aboard the International Space Station ran computer instructions, written by high school students, in bowling ball-size satellites floating inside the ISS cabin. The students' code told the satellites exactly where to go to complete challenges such as spitting out dust clouds and avoiding obstacles. Ceding control of small satellites to students is part of an annual competition called the Zero Robotics SPHERES Challenge, which is hosted by NASA, the U.S. Defense Advanced Research Projects Agency and the Massachusetts Institute of Technology. Today's run is the Zero Robotics finals. Those interested can watch a live broadcast of the event. Fifteen teams from the United States and Europe are competing to get their satellites to perform tasks related to cleaning up space junk. "SPHERES" stands for Synchronized Position Hold, Engage, Reorient, Experimental Satellites. 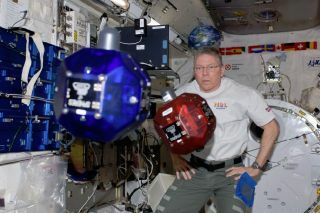 MIT, NASA and DARPA researchers use SPHERES to test spacecraft maneuvers, such as docking and flying in formation. This year the students had to program their SPHERES to deploy dust clouds that could remove space junk from orbit, dock with another satellite to harvest its parts, and maneuver through an unknown field full of debris. The SPHERES had to perform all of those tasks autonomously, just as spacecraft would, once an ISS astronaut activated their code. In the U.S., participating students watched their code at work over a direct transmission from the International Space Station, shown at the MIT campus. The European students watched from the European Space Research and Technology Center in the Netherlands.